I was out for 2.5 hours on the evening of Oct 11th 2008 doing an aurora watch after seeing the dramatic surge in activity. It was extremely cold with fog blowing through the fields. I didn't see any aurora action however the watch was not in vain. 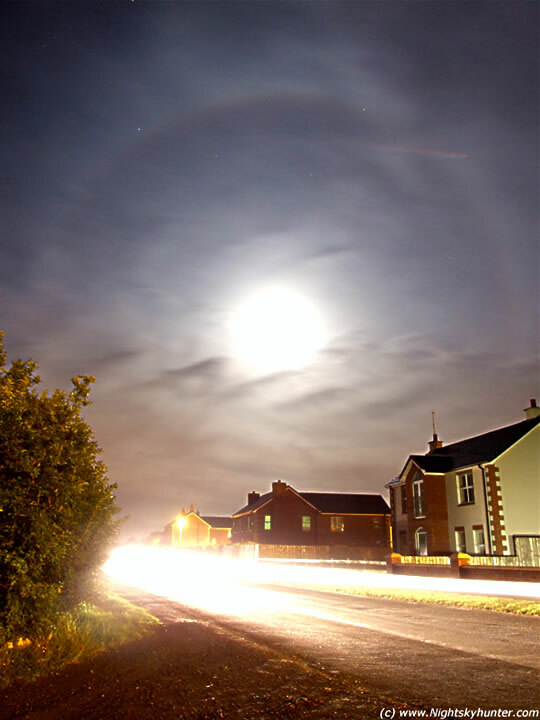 High level cloud blew in from the W and helped create a fairly nice 22 degree halo around the waxing gibbous Moon. The colours were visible with the naked eye so I took a few images taking advantage of the Saturday night drivers to get car trails. This is looking E along the Crewe Road from Maghera. Head light trails moving towards me. The Moon was in Aquarius. The stars above are in Pegasus. Enif is to the upper R. Taken at ISO400, 15 sec's at 28mm. Needless to say the occupants of those cars gave me strange looks as they drove past. Some even slowed down for a better look.